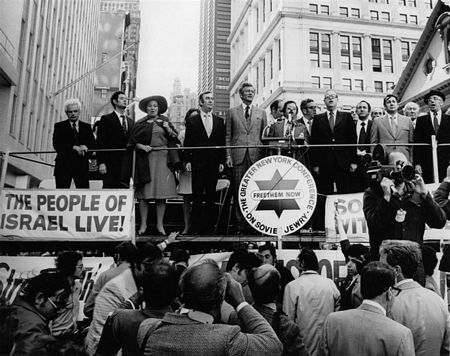 Sunday, October 14, 1973: At the Freedom Rally for Israel at City Hall in New York City. Singing Hatikva, Israel's national anthem, are (left to right): Hon. Paul O'Dwyer; former Prisoner of Conscience Arkady Voloshin; Rep. Bella Abzug (D-NY); Mayor John V. Lindsay; Jo Amar; Greater New York Conference on Soviet Jewry Chairman Stanley H. Lowell; Israeli Foreign Minister Abba Eban; City Council president Sanford Garelick; Greater New York Conference on Soviet Jewry treasurer Samuel Hausman; American Zionist Federation president Rabbi Israel Miller.